All adoptable pets 4 months and older are spayed and neutered prior to adoption. Each dog & cat is bathed and treated for the removal of parasites such as; fleas, ticks, mites and worms. Adoption fees also include the Rabies Vaccine and Annual Booster / 1st Puppy Shot. To ensure you are ready to adopt and to speed the adoption process, please review our Pre-Adoption Information Sheet and bring a completed copy of the Adoption Application with you when you come to the shelter. If you are adopting more than one dog or cat i.e. 2 dogs or 2 cats you are charged full price for the first animal and a reduced price for the second. 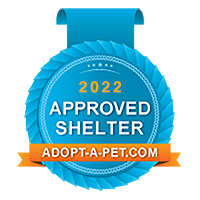 If you adopt one of our animals; click on the badge to apply for your FREE "Proud 2 Adopt" kit. Show others how rewarding and fun it is to adopt a pet. Click to see the happy endings!